Veronika Wild: Can we end the slaughter on our roads? Can we end the slaughter on our roads? In case you've missed the photo, I am talking about native animals here, not humans. It’s official- Tasmania is the Roadkill Capital of the world. Anyone who has been to Tasmania can’t fail to be shocked by the number of dead animals on our roads, although many councils do make an effort to clear dead and injured animals away. The causes are many – greater numbers say some; land clearing for plantations or housing developments which force existing populations to find new territories; drought – because roads create more run - off and their culverts tend to retain water and promise tender shoots; the search for mates; the warmth of the road in the case of reptiles and so on. I am not convinced that people throwing out apple cores contributes greatly as one person said. After all, you can drive the 260 km length of the Lyell Highway and see plenty of roadkill but you would be hard pressed to find a single apple core. Not that I am saying that you should throw out food. More likely it is because some other animal has already been killed. This is especially true in the case of carrion eaters such as crows, devils and eagles. It is also said that native animals die while trying to get to urban gardens because they are more tempting, but my guess is that there is far more traffic the other way - i.e. humans encroaching on bushland, which has the same effect, but requires a different response. An interesting test would be to see whether the road toll increases or decreases after land clearing. I also suspect that that there is now a lot more traffic on our backroads that in the past, making more roadkill both more likely and more visible. 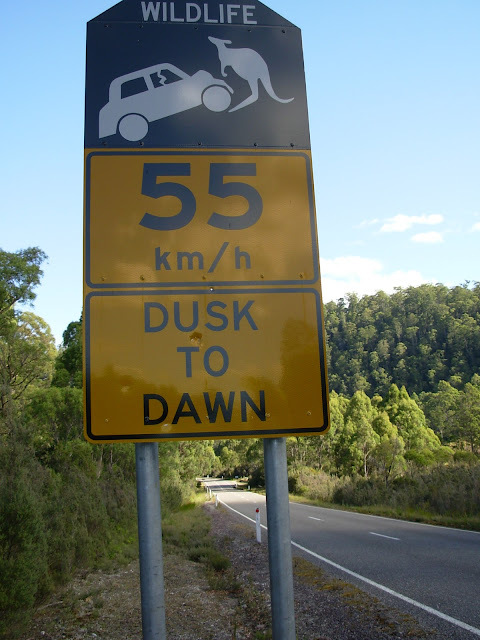 Several organisations – among them the Tasmanian Wilderness Society, Boronong Wildlife Park , the Royal Automobile Club, Parks and Wildlife, and Stornaway who do much of the work for councils, are now are urging motorists to drive more slowly, especially between dusk and dawn. A positive outcome of recent research by Hobday and Minstrell (2008) is that many major roadkill blackspots have now been identified and this information can be downloaded to your GPS before you drive. [Sadly, this research was only undertaken because four Tasmanian devils, newly returned to the wild after being vaccinated against facial tumour disease (at a cost of $25,000 per devil), were killed on the roads within weeks of release]. More signage like the above plus information about what to with orphaned or injured wildlife -Boronong Wildlife Park for example, is available 24 hours a day, has also been suggested, along with a leaflet for tourists. However, in my experience of travelling around our lovely state there is usually nowhere safe to pull over if you do find an injured animal, and if you do, there is a good chance you will be hit by a speeding car or truck coming up behind. When my German friends were travelling back from Port Arthur they were roundly abused by other drivers when they stopped to let an echidna pass. For as long as I can remember, Tasmanians have told me never to swerve for an animal lest I create a far worse accident. Historically, native animals have also been seen as a nuisance, as an overabundant competitor for food and crops, to be done away with as quickly as possible. Changing such attitudes will be difficult, especially when everyone is in a hurry – tourists and locals alike. While any effort aimed at reducing the death of native animals on our roads is to be applauded, I would like to see more proactive measures which depend less upon the skill and will of drivers. Clearing roadsides to aid visibility and to reduce vegetation which could be attractive to wildlife, definitely comes into this category. However, it would be much better if we could create tunnels under the roads in known blackspots as they do in Canada and Alaska, though this may be wishful thinking in a state too poor to even separate cyclists from motorised traffic. Much could also be said about the reintroduction of buffer zones and wildlife corridors. Fencing could at least be tried in those areas which have now been identified. For those who only see everything in economic terms, it should be noted that accidents and injuries cost money too - ask any insurance company, and our native animals, alive preferably are also a major tourist drawcard. For tips on how to drive safely around wildlife see the site tasmanian wildlife matters. It also has information on what to do if you see an injured or orphaned animal, briefly outlined below. Call a rescue service for advice. Be safe on roads and with stressed injured animals. Keep the animal warm, especially orphans and animals in shock. A pillow case kept in the glovebox is good for transporting many species, and a sturdy pair of gloves is handy. Keep the animal as quiet and dark as possible and get it to help as soon as you can. Keep a wildlife rescue phone number in the glovebox of your car or in your wallet. Phone DPIPWE on 6233 6556 during business hours or Bonorong Friends of Carers program at any time on 6268 1184. STOPPRESS: On tonight's ABC NEWS 22/1/2018. Boronong Wildlife park is it to open the Tasmania's first dedicated wildlife hospital.